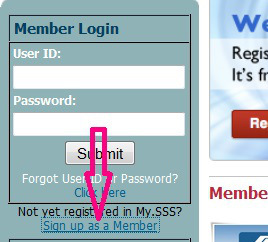 The solution on how to view or check your SSS online account and registration on website? This is the full tutorial guide to all Filipinos on how to check and view your SSS account online. First thing to note that when you are trying to access its sss website, please make sure that your browser is compatible because the website requirement to view is not suitable for google chrome browser that we are mostly using. You need to use the internet explorer browser for optimal viewing. 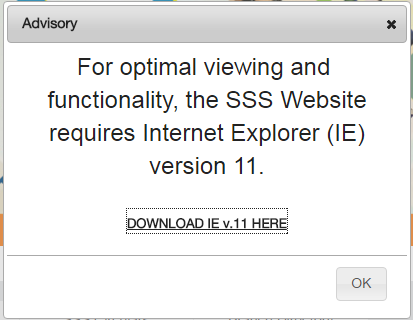 As you can see below, when you are trying to access its website while using any browser other than chrome, the site will going to display its message with advisory "For optimal viewing and functionality, the SSS website requires internet explorer (IE) version 11. Take note that the version should be at least 11 and most computers that has windows 7 OS has already updated Internet Explorer. Please see image below for your reference regarding compatibility for SSS viewing online. So, we will go to the step by step guidelines and procedures on how to check your online sss account. 1. Go to the official SSS website by clicking it HERE. It will redirect you to https://www.sss.gov.ph/ by opening another tab without leaving the instructions and guides in this page. 2. If you are already registered with your corresponding user ID and password, you can directly sign in. If you forgot either your password or user ID, just click the forgot user ID or password as shown in the above image and just follow the instruction on how to retrieve your account. Usually the details will be sent to your e-mail address. If you are not yet a member, You must sign up for a MEMBER account – it is important you select Member not Employer because you are registering as a member. You’ll need your SSS Number for this together with your latest SSS receipt payment, your personal info (name, birthdate, address, etc.) Take note that registering covers Phase 1 and Phase 2. 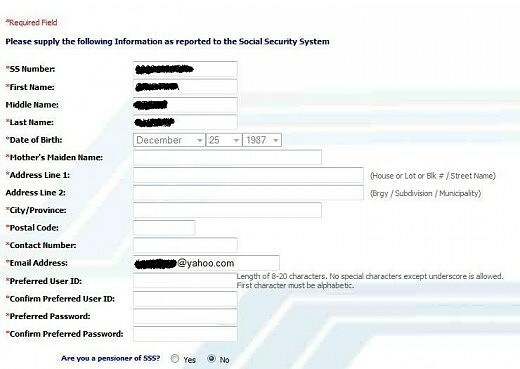 SSS will email you your log in username and password before you can sign in on your account. Complete all required fields as shown below. Take time to fill in the form with accuracy and free from errors and mistake, otherwise, it might caused some problem. So it's okay to be slow in filling those form as long as is all right. We have to take note that after we are done filling those forms, please be careful and double check your details before clicking the Submit button. SSS will email you after you clicked the Submit button. Check your inbox. It contains the link for the Phase 2. So right now, in a matter of minutes at most, check you inbox right away, if it doesn't show up, just refresh your e-mail inbox or just log-off to your associated e-mail account and try to log-in again and it may show up the link of the procedure and this is in the phase 2 guidelines sss online registration. Now, we are going to our Phase 2 of SSS Online Registration. Please be patient. No need to hurry here. Below succeeding images are some forms that needs to fill-up. 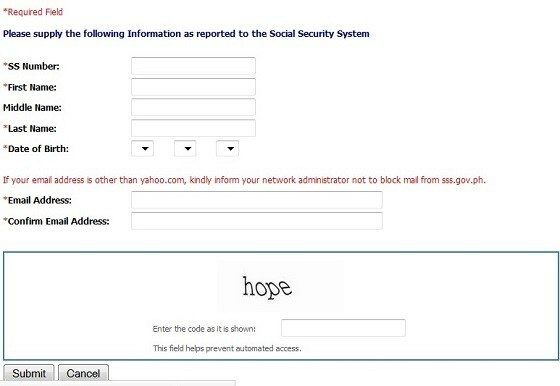 Again, please be patient and accurate in filling those forms. Please see image below. Please consider the below option in the above image. See to it that you choose the right option below. As we are taking note before, please double check everything you have typed before anything else like proceeding to finish and after it was all set, just tick the “I accept the Terms and Conditions” message at the bottom. After that, SSS will email you. You’ll receive something like this: That means you have successfully registered your account and you can now log in. So again, go over to your e-mail account and see the new e-mail arrive that SSS had mailed. Again, check your email inbox to see SSS email containing your username and password. Use these username and password to log in your SSS online account. Again don’t forget to login as a Member not as an Employer. I would like to congratulate you and give you a cheers as a sign of successful SSS online registration if you are following the right guidelines here. Anyway, you can go over to the steps that you may find you are missing on it. Please see below image if you find success in following these simple guidelines. 3. So for the number 3 guideline, just Log in your SSS account – use the username and password sent by SSS to your email address. Please keep your username and password so that you can access your account anytime or in the future. Once you are logged in, you’ll see the Welcome Message like that above. 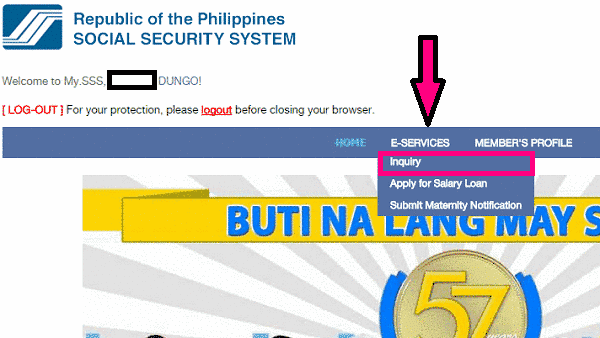 Select Online Inquiry and you’ll be taken to your SSS Employee Static Info. 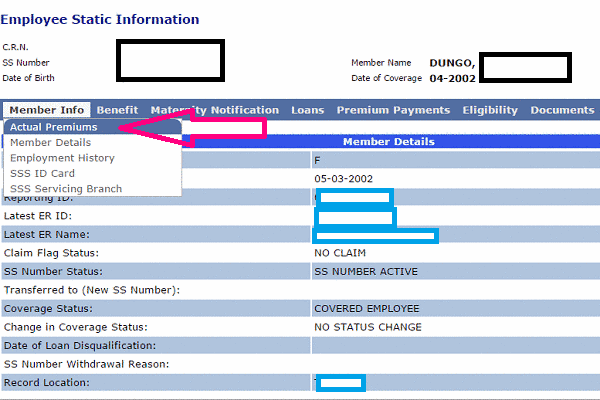 I think it is now easier to navigate the content of the sss if you are having a successful log in. Just make sure to be particular on small and capital letter of your user ID and password because the system is very case sensitive, meaning capital A is a big difference with a small letter a. Just be cautious with your typing skills. So I guess that's it. But wait, there's more on below guidelines on how to check some of the categories you might want to check your SSS online account. When you want to Check SSS Contributions and Monthly Premiums, you may select E-Services and go to Inquiry if you want to check your monthly contributions. Just see the image below. And for the Actual Premiums. 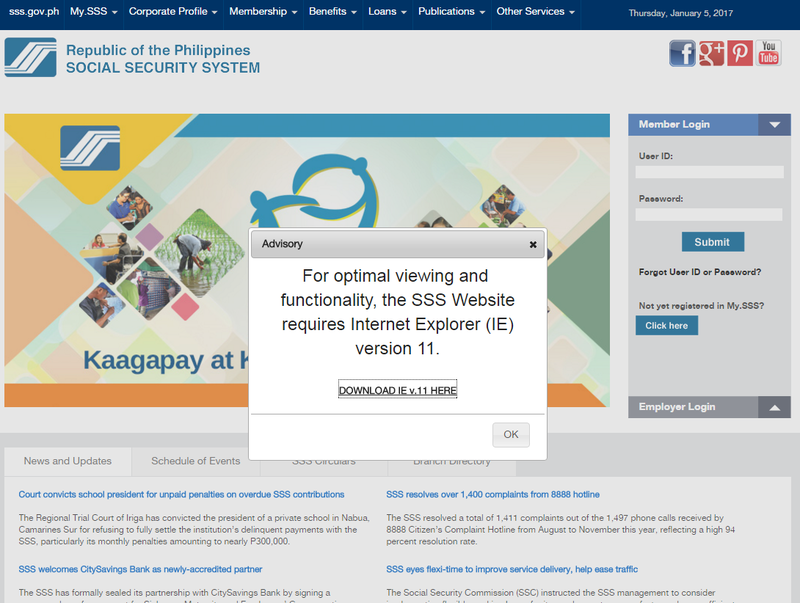 You will be able to view and check your SSS monthly contributions at the screen from the start up to the present time. You can print this out if you want. But you have the option to print screen, just hit the "prntscrn" on the keyboard found at the upper right of the keyboard besides "F12" to screenshot it and save it as softcopy on your local drive or you can e-mail it to your own e-mail so that it can never lost to somewhere out there, that is how I manage to save my account without losing it - that trick worked for me. Please see image below. So, I think I mentioned most of the guidelines on how to get and register your SSS online account. So, congratulations on having a successful viewing of your SSS online. SSS password usually expires after 90 days. You need to change them every 90 days. Always keep a copy of your email address and login credentials together with your SSS username and password so you won’t forget them. Your email username and password are different from your SSS username and password. I recommend using Anti-virus software such as the free anti virus like AVAST whenever you use the internet to protect your identity. The safest is access your sss online account with your own computer but if you are accessing it in the other computer like in the internet cafe, it's not a problem but be cautious like after you finished checking your SSS account, just press "ctrl + shift + del" on your keyboard and it will pop-up on your browser that you are clearing browser's history but there's still another option on ow to make sure that your account is in good hands, log-out all your accounts in your browser including your e-mail and close all the browser then you need to shutdown the computer - that's it! Remember that your SSS account is so important and you don’t wanna risk it. So, I guess, that is all for now. If you have some questions, queries, or you need some help, just write comment on the comment section below and state your questions, problems, clarifications, etc. Thank you and let's cheers and share it via sharing buttons below or located at the upper right of this page to help some of your friends out there! Please note that I am not an ambassador of SSS, not their employee, and nothing related to. I am just like one of you guys who has SSS online account and just want to share it for you to have a simple guidelines on how to check your sss online account. 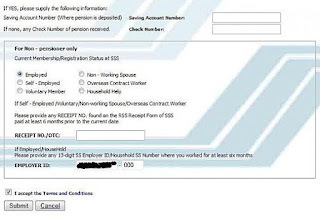 This page is all about sss online account, sss registration online, sss viewing records online, sss checking contributions, sss online inquiry, sss website registration, sss online account, sss viewing guideines online, sss checking account online, sss contribution online, and it's all about sss online checking.